These small African parrots get their name by forming a strong monogamous relationship with each other. 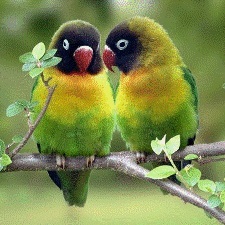 Lovebirds are known for choosing a mate and demonstrating their affections. They are available in a variety of colors, intelligent, and full of energy. Animated and full spirited these parrots will play for hours at a time and love hanging from their toys, resting in birdie tents, or simply riding on your shoulders. As you might expect, they can become very attached to their owners, especially when kept as single parrot (vs. pairs). And despite their relatively small size will not think twice about defending their relationship with much larger birds. Although they not talkers, vocally they are able to articulate a wide range of sounds including the ability to imitate people. They also benefit from lots of interactions to keep their minds from getting board. Due to the high activity level of Lovebirds it is always good to purchase a larger bird cage that provides sufficient space to release all their energy. 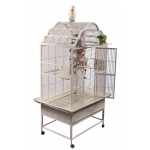 If you are able, shop for a bird cage that is 24” wide and 24” deep. Virtually all of our medium size bird cages will work. Lovebirds are creative parrots and will try to find way to escape their home. The ideal bar spacing is ½ inches to 5/8 inches. The maximum bar spacing on a Lovebird cage is ¾ inches. Finally equip your cage with a variety of perches (size and placement), chew toys and soft wood products. These are extremely active parrots and will help them stay busy and entertained. - Love fall inbetween a small and medium parrot, bar spacing between 1/2" to 5/8" is best. Be sure it does not exceed 3/4"
- They like are very active birds. Larger cage choices will provide more room to release all their energy.